When I commuted to Tysons from DC, I would have lots of time stuck in stop-and-go traffic to consider the reasons and causes for traffic slowdowns. It seemed that often, we'd all be slowing down and then speeding up again for no reason. I always speculated that sudden braking could cause a wave of slowdowns that would propagate backwards for hours/miles, leading to the annoying slow-down-speed-up cycle. We finally got some frozen precipitation. It was only an inch of snow, but given where we live, it was enough to delay school for two hours. 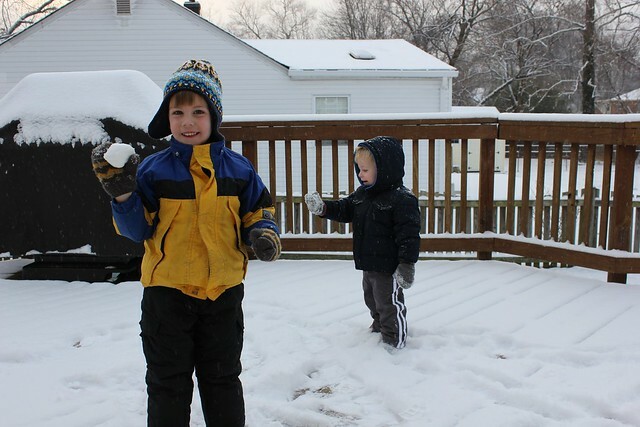 So the boys got to enjoy playing in the snow, albeit only briefly. Online real estate company Redfin recently listed its hottest neighborhoods in metropolitan areas across the country. In addition to D.C.'s Petworth and Rockville's Fallsmead, the list included our neighborhood, Pimmit Hills. I got a kneeling chair as a Christmas gift from my mother-in-law. It's something I've wanted for a while for work since normal office chairs hurt my back after a while. I went to a pretty good high school (cough, IB, cough) and I had a pretty great physics teacher. Yet we never went over anything like this video in our physics class. And it's too bad because I think it would have really made physics that much more interesting. We hope everyone has a happy and prosperous 2013! I recently switched from an Apple iPhone to an Android phone, specifically the Google Nexus 4. I was confident I could adjust to the differences in the operating system and ecosystem, but I was very worried about support. The Nexus 4 is only sold online straight from Google and Google is not exactly known for warm and fuzzy personal support. With Apple, you can walk into any Apple store and get help for a phone problem. With my iPhone 3G, I once had a problem where the phone stopped acceping a charge. I once brought my phone into my nearby Apple store and they just handed me a new phone and I walked out in under 30 minutes. I fought the hordes to purchase a Nexus 4 during the initial sale debacle. My Nexus arrived 2 weeks later and I was excted to start using it. I'd even researched and knew that I could swap out my micro SIM from my iPhone 4 and put it in my Nexus 4. That's when the fun began. Our kids love going for walks in the neighborhood. We live in a nice, safe neighborhood with lots of streets but also lots of sidewalks. The kids will ride their trikes or we will push them in the stroller. It's fun for the whole family. However there's one thing that's really starting to bug me, and it's not what I would have expected: overly polite drivers. These guys never stop being funny. But seriously, go vote.